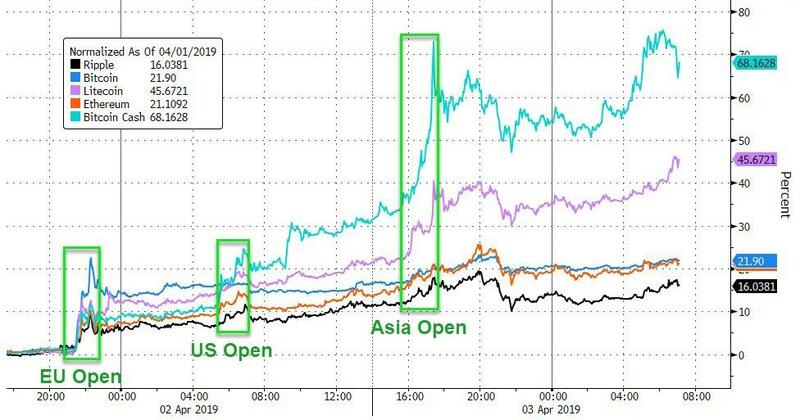 With cryptos soaring sharply just after midnight Eastern on April 2, and continuing their impressive ascent since then, with most tokens rising above their 200DMAs for the first time in a year, one question still puzzles traders: what catalyzed the surge. While we previously presented various potential triggers for the buying spree, the puzzle remains, with some so-called experts even boldly suggesting the move which has added tens of billions in market cap to the crypto space, was due to a tweet by a so-called "prominent" contrarian on crypto who turned bullish (spoiler: that had nothing to do with it). Addressing this issue, the crypto derivatives traders behind sk3w.com looked at the internals of the move, and concluded that the surge higher appears to have been driven by a very large short squeeze in a low liquidity backdrop. 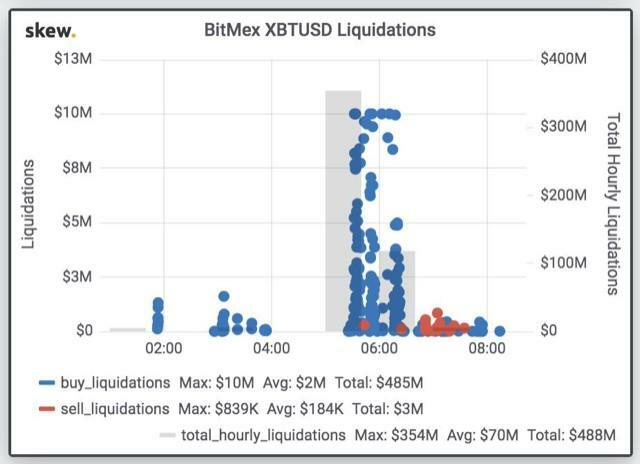 Specifically, they point out that between 5.30 and 6.30 a.m London time when the bulk of the upward move took place, nearly $500 MM of buyer order liquidations took place on Bitmex - the largest futures platform - in the space of one hour. 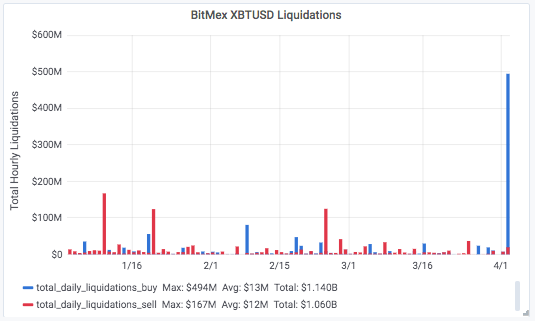 Putting the move in its proper context, here is the action in the last three months in terms of liquidation activity on Bitmex. 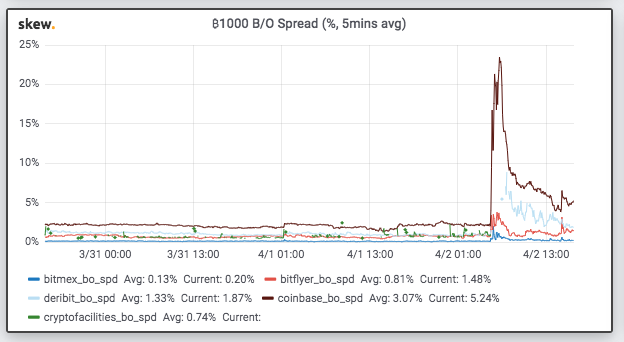 Clearly something or someone got spooked, and was forced to cover (perhaps in connection with the CBOE's recent decision to end bitcoin futures trading). Once the squeeze got rolling, market makers widening prices and forced buy orders pushed the price higher by $1,000 in one hour - with the bid/ask for 1,000 bitcoin exploding from 5% to nearly 25% on Coinbase, as liquidity collapsed in what was a clear foreced buy in (On the chart below, Coinbase is the only physical exchange, the others are derivatives). 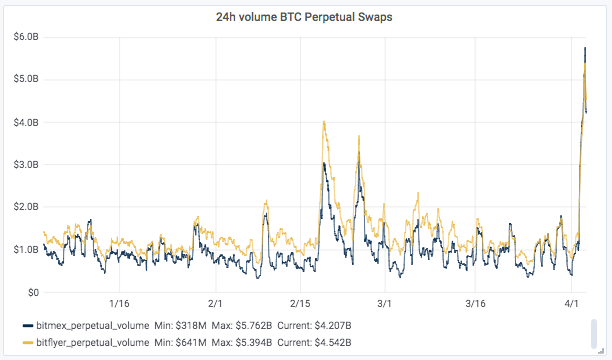 And another observation from the Sk3w deriv traders: yesterday was the largest session of the year for the bitcoin market and the so-called perpetual swaps - its most liquid derivatives instruments. Bitmex and Bitflyer each traded $5BN+. To summarize: a massive forced squeeze which tripped the derivative market, and which judging by the action this morning, is still continuing. 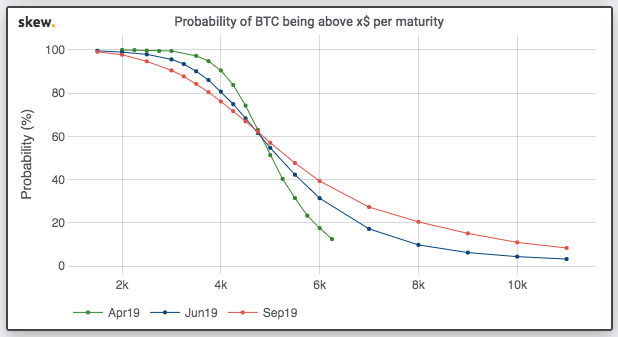 Meanwhile, for those curious what the recent surge means for the future of crypto prices, with both spot up and vol up, the probability of Bitcoin rising above $10,000 by September is now 11%, vs 4.2% last week.